This week marks the end of my first full semester of graduate school at the University of Michigan in the MS in Computer Science and Information Systems program. I was enrolled in coursework in Autumn 2012, but those classes were actually senior level computer science undergraduate courses recommended by the university to fill the gaps in my knowledge due to not having a Bachelor’s of Science degree (I have a BA in psychology from New Mexico State University). It was a very challenging semester both in terms of the content of the coursework (so much math at times) and the requirement to balance the coursework with my full time career, my full time role as a wife and my leisure hobby of weekend travel. There were quite a few weekends whilst we were en route to Asia that I had to maintain the self-discipline to study on the plane. Luckily, I was smart enough to enlist the assistance of both my husband and and my closest female friend to help keep me on track with accountability and peer pressure. And also I was lucky to have not only my husband, but additionally our friend who is an engineer (currently residing with us while on contract for a local company) to help tutor me in the math where I was lacking such as vectors and other linear algebra basics. I cleared the semester with an A- in Computer Architecture and an A in Information Retrieval. The architecture course was really an eye opener with regard to the newest processor technology coming down the pike. We learned all about Symmetric multiprocessing (SMP) and other sorts of common processor configurations. We dove deep into pipelining and other subject areas that were addressed only lightly in my undergraduate computer architecture course. All of the information was directly relevant to my current job and as a bonus a lot of the papers coming out of my industry regarding analytics are framed with regard to processor technology and now I better understand those relationships. My course on information systems covered the history of information retrieval and we spent most of the class learning the algorithms that drive search results and the ranking of those results. I’ve come out of the course with a much greater appreciation for the math and science that is behind companies like Google. Handling multiple languages, trillions of documents, spelling errors in queries AND in the related documents you want to return, categorization of documents, etc - this is all pretty complex stuff that I never much gave thought to previously. Which really speaks to the beauty of technology - we can use it successfully without really ever understanding how it works or what’s going on “under the hood” so to speak. But it sure is nice after being in this field for 10 years to not only be adept at using the technology but finally to truly understand the wizardry behind the curtain. The university does not offer summer graduate courses (except for thesis work) so I’ll be returning to the daily grind of classes when September rolls around again. Just as the school semester is ending, recent projects at work are also wrapping up. Actually, work has been going pretty well for me, but not as well for the husband. Both of our companies have been undergoing some major reorganizational changes as of late in the pursuit of greater profitability. For my company (CSC) that means restructuring the employees into different groups (or at minimum renaming groups to more accurately reflect their focus), realigning job titles, revamping our mission and value statements, reducing the complexity of our organizational structure (mostly by taking out excessive layers of middle management), changing the way we pursue and capture new and rebid business contracts, and rededicating the whole company to a focus on customer and shareholder value. I have to report that so far it’s working very well, especially as reflected in the CSC share price. I feel more invigorated and pleased to be working for the company than ever before and I’m excited to continue marching down the road of success as the last of the changes are implemented. Unfortunately at my husband’s company things are not going quite as smoothly. I suspect that many of the changes have not been as carefully planned or executed and much of the modifications appear from the outside to be random panic layoffs in order to move the company structure as quickly as possible back into alignment with the original owner’s vision (who recently has retaken control of the company). So far the random layoffs have not hit my husband’s job but we are of course concerned that may not hold true for much longer. And of course with such pressure hanging over the remaining employees’ heads, the workplace has become one of stress and poor morale. I also spent a half day with a friend in the Sunset district where we hiked up Grand View Hill. It’s the oldest and last remaining sand dune in San Francisco. Once all the houses were built along the shoreline, the sand was forever cut off from blowing across the landscape and the sand dunes gradually disappeared. At the top of the Grand View Hill we were treated to a 360 degree view of the entire San Francisco area including downtown, the Bay bridge, Golden Gate bridge, Golden Gate park, Twin Peaks, and more. It was absolutely beautiful. 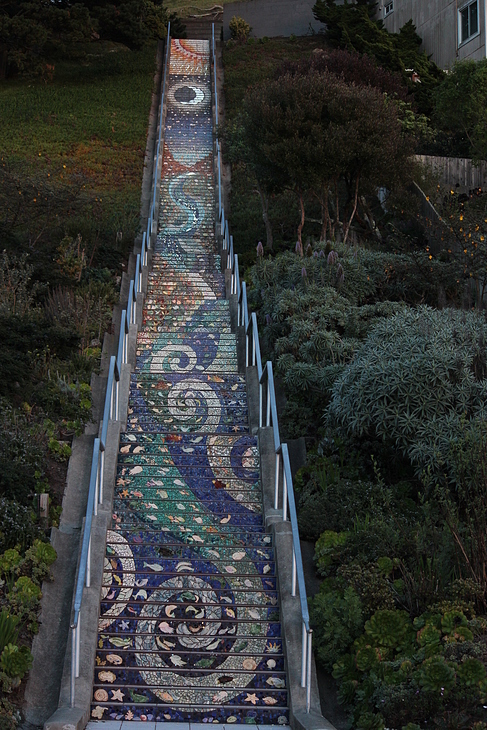 After descending Grand View Hill we walked down the lovely mosaic steps (here’s a link to the best picture of the entire staircase: http://www.sfmuralarts.com/pics/1424.jpg) before catching a bus back to downtown San Francisco. One other notable stop during my time in the city was the dinner I enjoyed at Fang’s Restaurant. While this boutique Chinese restaurant offers a standard menu with daily specials, there is also the possibility of ordering off menu for those in the know. I had been tipped off by a fellow frequent flier that a simple request to the owner or senior waitstaff will find you the recipient of a custom menu based around your taste preferences. I was in the mood for eggplant and so I was brought a starter salad of tomato, Asian pear, herbs and rice crackers dressed deliciously followed by a main entrée of sautéed eggplant and fried shrimp in a sweet honey sauce. They would have continued with dessert if I hadn’t waved it away on account of feeling full from the generous portions of the salad and entrée. Really some of the best Chinese food I’ve ever had and I can’t recommend it enough. It’s very convenient also – a few blocks south of Market street near the financial district. Let’s talk new beginnings. I’m guessing you’ve noticed the sharp uptick in the book reviews I’ve been posting lately? There’s a story behind that (of course there is!). I’ve always enjoyed reading anything I can get my hands on and I have been working diligently on curating a fantastic collection of cookbooks from all around the world as we travel. Recently I have decided to formally join the ranks of semi-professional book reviewers. I got things started by joining the National Book Critics Circle for a nominal annual fee and this self-appointed new hobby consists mostly of selecting books I’d like to read (especially cookbooks I’d like to add to my collection), soliciting complimentary review copies from the associated publishers, reading the material end to end, and posting informative reviews on Amazon.com, Goodreads.com, and here on my blog. Occasionally publishers request I submit feedback directly to them as well. And of course I’m careful to keep integrity at the forefront, never allowing the book-for-review exchange to slant my reviews for the benefit of the publisher or author. Indeed, some of the reviews I’ve posted lately should be strong evidence of that. I thought hubby would be quite excited to learn I’ve stumbled upon an ingenious way to fund my cookbook collection from here on out, but he just put his head in his hands and whimpered “not more cookbooks”. What can you do? I told him to be glad I’m not a car collector. Anyway, the onslaught of cookbook reviews will inevitably continue each week, but for easy sorting for those of you on the mailing list, remember that the subject line always reflects the content of the post and so will contain ‘book review’. That should allow you to auto-sort the book reviews away from the main stream of incoming blog posts should you not wish to read them (but of course I encourage you to read them!). Jenni . . . love your blog! Thanks from the admin community here at SAS for your paper and panel discussion at Global Forum 2013. Hope to catch your next paper at one of our upcoming conferences.